Mr Monkey made a number of bus rides to get into the centre of Manchester, then scampered along to the Royal Exchange Theatre for the press night of The House of Bernarda Alba. The House of Bernarda Alba was written by the Spanish poet and playwright Frederico Garcia Lorca in June 1936. He was murdered, probably by Nationalist militiamen, two months later, and the play was not staged until 1945. 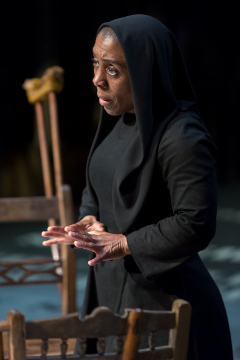 The House of Bernarda Alba starts just as the husband of Bernarda Alba is being buried. Alba returns and tells her household (six daughters, two maids, a mother with dementia, and a housekeeper) that she's going to lock all the entrances to the house and they're all going to spend the next eight years in mourning. As the oldest is 39 and about to be married, and the others all rather like the idea of having lives of their own, this doesn't go down very well at all. 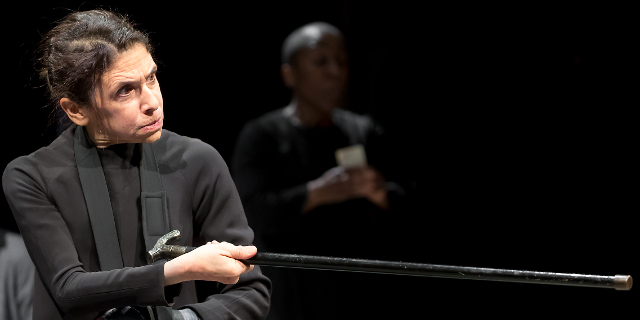 It's not quite King Lear - largely because Bernarda doesn't have a kingdom to split between her daughters and isn't concerned about being loved - but the house is full of repressed emotions and the potential for tragedy. The set is basically a circle of seven chairs, each different and slightly odd in design, linked by lines of light on a wooden floor. Rather sinister sacks hang above each chair. The entrances to the stage are marked with large stenciled descriptions of a part of the house, such as FRONT DOOR, or some other characteristic, such as IT IS SUMMER. Further, slightly smaller, descriptions of the decorations in the house run around the upper gallery, while there are a number of display screens on the front of the lower gallery. Throughout the play, these screens display captions - mostly the lines being spoken - for the benefit of D/deaf patrons. Mr Monkey found all this signage made the stage more enclosed and oppressive, which added to the atmosphere. These are all part of the co-production with the Graeae Theatre Company which aims to produce totally accessible productions. This includes signing incorporated into the action of some of the characters, and audio description for the visually impaired incorporated into script. Altering the script may have annoyed people who knew the play, but didn't upset Mr Monkey who was completely unfamiliar with it and just assumed that some of the repetition was just caused by Bernarda Alba refusing to believe that her children had speech or hearing problems. He was more upset that the captioning didn't always match what was actually said by the actors. Mr Monkey was initially worried about suffering from an information overload but he got used to it quickly enough. The cast are excellent, as Mr Monkey expected. Kathryn Hunter was suitably arrogant as Bernarda Alba, ordering her household about, yet with a convincing vulnerablity at times. Alison Halstead stood out for Mr Monkey as the housekeeper, Poncia, the confidant of everyone in the house but having to protect the daughters from Bernarda without outraging Bernarda, and also to protect Bernarda from her daughters. Mr Monkey was gripped throughout the play, though he did find the ending just a little anticlimatic; the breaking of Bernarda's cane of authority turns out to be symbolic and changes nothing. On the bus home Mr Monkey decided that was Lorca's point. 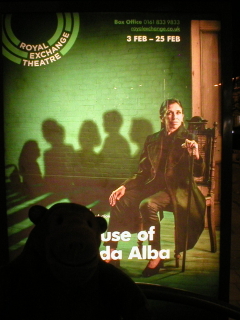 Mr Monkey thoroughly enjoyed this production of The House of Bernarda Alba and recommends it to anyone who wants to spend an evening locked up in a Spanish house with an uncomfortable atmosphere. The House of Bernarda Alba runs until 25th February 2107.